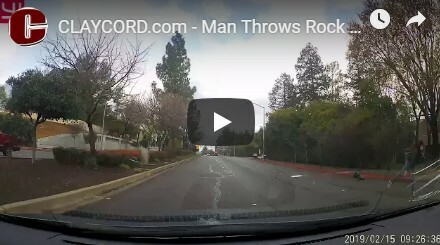 A man was arrested today after he threw a rock at a vehicle on Clayton Rd. in Concord, breaking the car’s window, according to the victim. The victim told Claycord.com the attack was completely random, and he suspects the man was on drugs at the time of the incident. Concord Police confirmed a vandalism arrest was made today on Clayton Rd., but the man’s name is currently not available. Meth use in Concord is SO bad. NOT saying the suspect was. where is this? hope to be to avoid it if possible. Cannot be Vandalism, since that tribe died out centuries ago. I’m guessing it was an act of delinquency, desecration, or sabotage. I would have said hooliganism, but did not want to disparage an Irish family. ….between La Vista and Farm Bureau. So, is that before or asta la vista??? LOL! One time I was in Martinez on Pacheco in a turn lane with another car in front of me. As soon as we turned left onto Morello ave a woman with a bat was standing in the in the middle of the road refusing to move. She smashed the windshield of the car in front of me, totally unprovoked. The car swerved around her and I took a sharp right to avoid the crazy completely. People are nuts. Did you hear what the driver was listening to? No wonder the dude chucked a rock at ‘em. I have called the PD in the past reporting rock throwers at Clayton road just before Farm Bureau RD. They were teens near the empty lot using dumped furniture as their hide. I was driving toward Clayton and they were hurling rocks across the road at cars traveling out bound Clayton. They had great arms and ran fast after they realised I saw them. Both were Hispanic males 15 to 19 wearing black tops with jeans. Nice arm rotation, spring training around the corner. sign him up! I had a similar incident on Farm Bureau Rd almost to Willow Pass Rd 3+ weeks ago. It looked like the rock came from a second story at a nearby apartment building. It flew down and hit the windshield with a loud noise and the windshield cracked in all directions after it hit near the base of the windshield. Really irritating to have to pay our deductible and file an insurance claim thanks to thoughtless people. Glad they caught this joke! When I was living down south some kids threw a rock (actually a chunk of concrete) off an overpass which struck a person riding as a passenger in a convertible. Permanent brain damage, total vegetable. Really awful story. They had bulletins everywhere but they never caught the teens responsible. People just don’t understand how much damage they can cause others with their careless actions. Since we’re relating stories about objects being thrown at vehicles, here is one. I have a good friend who grew up in Dublin. There was a Teenager who was notorious for speeding up and down my friends street in his hot rod. One of the neighborhood fathers had complained and chastised the youth numerous times to slow down but to no avail. One afternoon the father heard the car racing down the street toward his house so he ran out and tossed a broken drive shaft at the car as it raced by. The drive shaft sailed through the windshield of the speeding car and killed the kid. Father ended up going to prison. A harsh lesson in physics was learned that day. Beside a fine and a couple of overnighters on government money he should pay for the windshield. So many of these people never have to pay for the damage they do. It’s illegal to drive when you’re stoned. Any person that throws a rock at a moving vehicle probably wets the bed at night!.